Alaska Airlines CEO Brad Tilden, left, and Hawaiian Airlines CEO Mark Dunkerley with the 1929 Bellanca Pacemaker. Two aviation geeks met up last week to fly an old plane. That usually wouldn’t be noteworthy, except the pilots just happened to be Alaska Airlines CEO Brad Tilden and Hawaiian Airlines CEO Mark Dunkerley. And this exact aircraft – a 1929 Bellanca CH-300 Pacemaker, tail number NC251M – has historical ties to both airlines. Nearly 90 years ago, this was the first aircraft in Hawaiian’s fleet. A few years after that, the plane was brought to the state of Alaska and served in the fleet that would become Alaska Airlines. It’s a special connection between two pioneering airlines named for states that are uniquely reliant on air travel. And it made for a fun flight for a couple of guys who are crazy about airplanes. Inter-Island Airways was renamed Hawaiian Airlines in 1941. Tilden and Dunkerley are both general aviation pilots. Tilden was visiting Honolulu to celebrate Alaska Airlines’ 10 years of service to Hawaii, and Dunkerley invited him to take a spin. Retired Captain Rick Rogers, an archivist at Hawaiian Airlines, knows the plane’s history better than anyone. He’s collected documents over the years that tell the plane’s story. 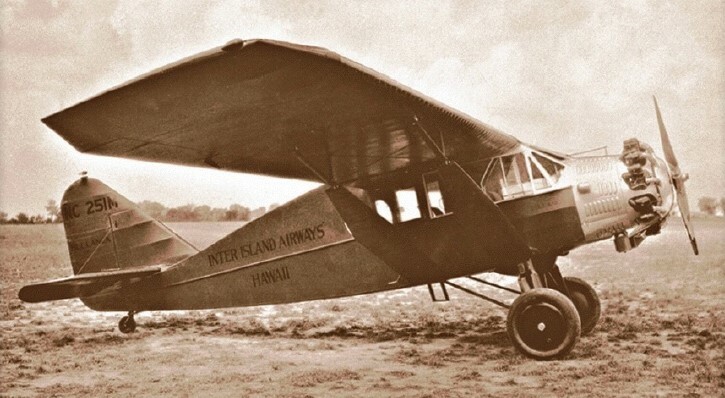 Back in 1929, the Bellanca was the first aircraft owned by Inter-Island Airways, the company that would become Hawaiian Airlines. The Bellanca was used for Honolulu sightseeing tours to help promote air travel, carrying more than 12,000 people at a cost of $3 per person. The plane was never used for inter-island travel, and was eventually sold. The aircraft wore the Alaska Airlines paint scheme in the 1940s. Photo from Alaska Airlines archives. By 1935, the plane was shipped to the state of Alaska, where it began flying for McGee Airways and Star Air Lines, two of the airlines that eventually became Alaska Airlines. The Bellanca delivered supplies in the state of Alaska. At the time, Alaska Airlines was known for delivering people and supplies to remote villages and camps. The landing gear was interchangeable – wheels, skids or floats – depending on whether the “runway” was dirt, snow or water. Alaska Airlines eventually sold the plane in 1949. Today, Hawaiian Airlines uses the plane to take employees on sightseeing tours around Honolulu. Fast forward to 2009, and Hawaiian Airlines re-acquired the Bellanca (which had been grounded since 2000) from an aviation enthusiast in Oregon. Hawaiian initiated an ambitious restoration project at Port Townsend Aero Museum in Washington state to return the plane to flying condition for the company’s 80th anniversary. Support for the restoration was provided by many volunteers both from within and outside the company. Then just this year, the Bellanca was completely overhauled in an extensive 11-month restoration by RARE Aircraft in Faribault, Minnesota. The airplane now holds the distinction of being one of only two remaining Bellanca Pacemakers in the world that still fly. Information from Hawaiian Airlines archives included in this story. 13 comments on "CEOs of Alaska Airlines, Hawaiian Airlines fly 1929 plane that has historical ties to both companies"
Alaska Airlines might consider buying Pacemaker NC196N “Shaky Jake” back from the Canada Air Museum & donating it to the Alaska Aviation Museum where it belongs, instead. It should never have gone to Canada in the first place. I don’t imagine they’d let it go for what they paid for it in ’68, but that was a corporate decision at Alaska Airlines, & surely I do not jest…. Perhaps they would like to donate the Bellanca Pacemaker to the Alaska Aviation Museum for its collction of Alaska, and Star Airlines aircraft. We don’t have one yet. These two airline CEOs could have an adveture flying it to Alaska, as their predecessors once did, for sure. LOL. Rob surely you jest?! Why in the world would HAL simply hand over a piece of it’s original history?! Nice try. Ben…..I thought I typed ‘restoration’ but it says ‘registration’. I’d like to think it was spell-check rather than my own goof! Your story reads as if the last restoration was by Port Townsend in 2009 when acquired by Hawaiian. In actuality the aircraft just completed a restoration this year in Minnesota. Aloha! As a former Alaska employee, and current Hawaiian employee, I have ties to both great airlines. I’ve been fortunate to fly in this aircraft many times. It’s available (free) for employees to book for sightseeing flights around Oahu, flown by volunteers who are also Hawaiian Air pilots. Thanks for the info Steve….I would love to fly in that plane since it’s the same one my grandfather flew in beginning in ’35. This is definitely on my bucket list which was blank till your post! I’m excited! Dang. I was so excited that I didn’t read closely. You have to be an employee! That is a bummer! Do you have any idea who I would need to contact to see if there could be an exception? This plane answered a big question….. When did Star Air Service buy McGee Airways? We recently discovered that on Mar 4, 1935, McGee Airways bought the NC251M. It was the last plane that McGee Airways purchased. Shortly after, Star Air Service’s owner approached McGee Airways owner to form a merger. McGee wanted to sell not merge. On April 20, 1935 Star Air Service bought McGee Airways (which included the NC251M) and became the largest airline in Alaska. Star Air Service went on to become Star Air Lines and then Alaska Airlines although flew under the name Alaska Star Airlines for a couple of years. Why do I know this? My grandfather, Steve Mills, began a flight school in the late ’20s, in Seattle, before being convinced to relocated in Anchorage. Mills and his 2 new partners began Star Air Service on about April 7, 1932, Mac McGee began McGee Airways shortly after on about April 12th. I’m still not sure why McGee gets any credit for starting Alaska Airlines since all the documentations, legal papers and evidence says otherwise.